Moved new release to its own folder in repository. Link updated. Zip file contains just the compiled application. No installer, etc. 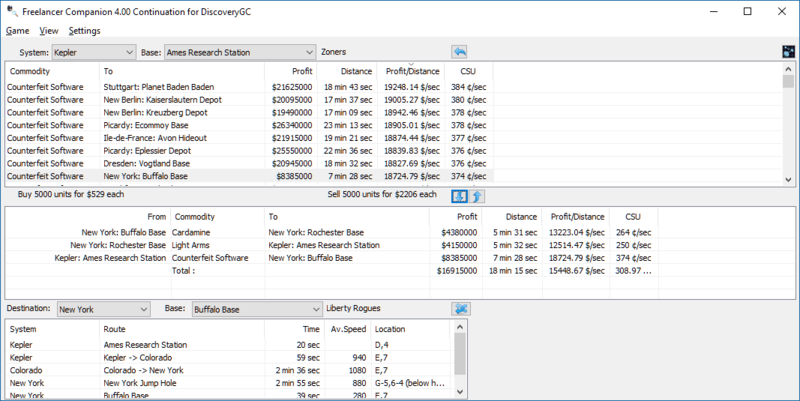 When I started using Freelancer Companion after I began playing on the DiscoveryGC again, I noticed a few issues with the app among some other features that may be useful for people using it. The way that FLComp would search for a running FL client has been fixed so that it won't fail in certain cases. To begin with, FLComp needs to be "Run as Administrator" to attach to the FL Client. The application also wouldn't tell you when it failed to attach. Additionally, the application would sometimes not find the FL Client. I personally ran into this when there were more processes to be enumerated than the 256 it was hardcoded for. This now loops through, repeatedly increasing the size by 256 until it is larger than the number of processes enumerated. Two filters have been added to the Limitations settings. 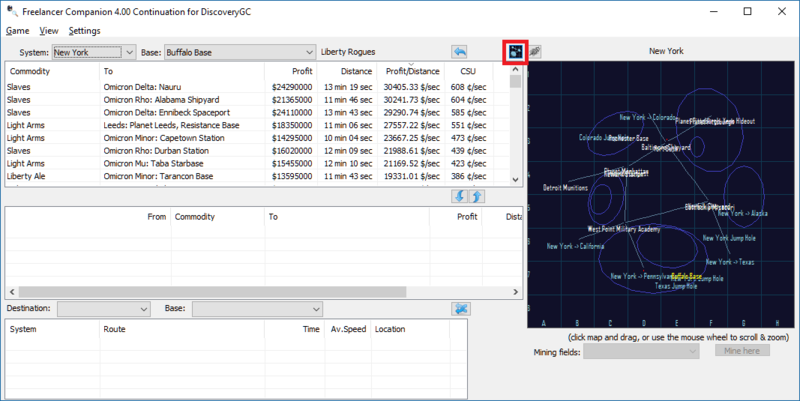 Avoid freighter-only routes - This uses the Solars ("jumphole_notransport" and "jumphole_fighter") for jump holes and object Archetype ("dsy_comsat_planetdock") for docking points to ignore those bases / paths when this is checked. 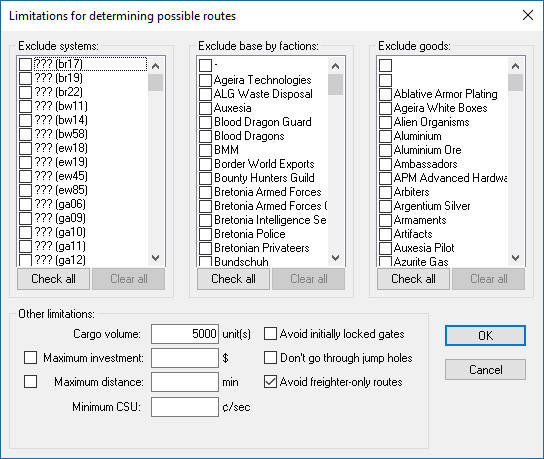 Minimum CSU - In addition to CSU always being shown in the commodity/destination list for the selected base, this filter has been added allowing users to ignore commodities / destinations where the CSU is less than what is entered. Trade Route Building - A new panel was added to allow users to store and remove a selected item to construct a trade route using the up/down arrow buttons). When the "From" base of the first item is the same location as the "To" base of the last item, a "Total" line is added. Edit: System Map hidden by default - Use the NavMap button in the top right to show/hide the System Map. Yes, it isn't perfect and there are plenty of bugs from the changes that were made that I'd rather get fixed but would rather this go as-is for now so I can take a break from it but also have something that works a bit better for the DiscoveryGC server. it seems to want some other fils to be present, somthing about vb 4 ?? Those are the error mesages before it just shuts down..
or should I copy it nto my existing fl companian folder ?? If you can actually make a functional upgrade, that would be wonderful. The heavily needed feature from the development point of view is a "button" that forces a recalculation of all the data without having to exit and reload the program from scratch. And don't forget the option from the file menu to save base to base travel times. That is the key feature that allows economy development. (09-17-2018, 01:20 AM)kerfy Wrote: it seems to want some other fils to be present, somthing about vb 4 ?? Weird, I ran it after uninstalling FLComp on my PC and it worked fine. Not to mention there being no dll files in the FLComp folder. Likely from changing over to newer version when I initially opened in in Visual Studio to start tinkering with it. Will have to look into that. Xoria, the base to base travel time should still be there. As for a Reload INI files button, I could certainly look into that. Big kudos, amazing work, finally the FLCompanion looks good, minus the boring as well. Ahh..there you go..work fine ..
Xoria, what are the defaults you use for FLComp? I was going to bother you over Discord about this, but you need to set it up to avoid the non transport jumpholes such as Omicron Minor -> Alaska. These are defined at the very top of initialworld.ini under DATA.